NORTH BAY, Ont. — The North Bay Battalion, fresh off an overtime victory over the London Knights, leaders in the Ontario Hockey League’s Western Conference, plays host to the Central Division rival Sudbury Wolves at 7 p.m. Thursday. 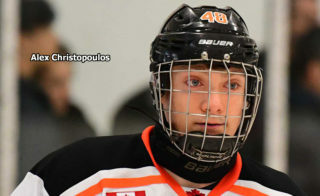 The sixth of eight meetings follows a 5-0 Wolves win on home ice last Wednesday night in the Northern Ontario rivals’ most recent get-together. Sudbury got shorthanded goals 47 seconds apart from Blake McConville and Blake Murray in the third minute of the opening period and never looked back. “We want to get out of the gates a little bit quicker than we did last time against them, and I think that’s going to be key, is focus on those first five minutes and then we go from there,” assistant coach Adam Dennis said Wednesday of the Battalion, which has a won-lost-extended record of 22-21-3 for 47 points, tied with the Mississauga Steelheads for third place in the division and sixth in the Eastern Conference. Since blanking the Battalion, Sudbury has completed a five-game home stand with two losses, a 5-3 setback last Friday night to London and a 7-4 loss Sunday to the Sault Ste. Marie Greyhounds. Goaltender Ukko-Pekka Luukkonen, who backstopped Finland to gold in the World Junior Championship at Vancouver and Victoria, has played the last five games, including making 23 saves to shut out the Troops. Luukkonen, who turns 20 on March 9, is third in the OHL in goals-against average at 2.51, second in save percentage at .919, first in shutouts with four and tied for fourth in wins with 22. Left winger David Levin, Sudbury’s leading scorer with 18 goals and 24 assists for 42 points in 43 games, has been suspended for three games after drawing a match penalty for crosschecking against Sault Ste. Marie. 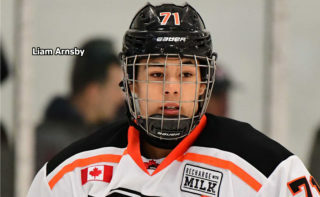 Centre Quinton Byfield, the first overall pick in the OHL Priority Selection last April, is second among Wolves scorers with 17 goals and 18 assists for 35 points from 40 games, while Murray has 18 goals and 11 assists for 29 points in 43 games. 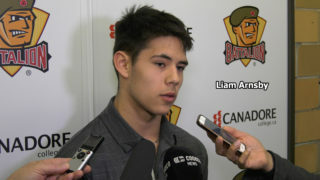 Overager Justin Brazeau, who paces the Battalion with 42 goals and 36 assists for 78 points in 46 games, is second in OHL scoring to fellow right winger Tye Felhaber of the Ottawa 67’s, who has a league-leading 48 goals and 31 assists for 79 points in 45 games. Centre Morgan Frost of Sault Ste. 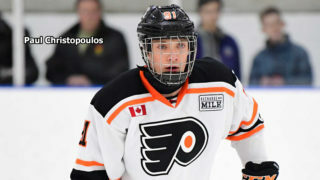 Marie is third with 30 goals and a league-high 45 assists for 75 points in 38 games, and London centre Kevin Hancock is fourth with 36 goals and 38 assists for 74 points in 45 games. 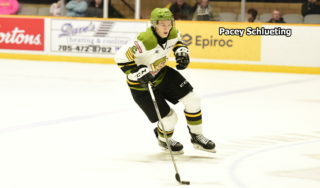 Brazeau, a 13th-round pick in the 2014 OHL Priority Selection, is seventh on the franchise scoring list with 203 points, from 109 goals and 94 assists, in 246 games. He needs four points to tie Mike Amadio as the leading Battalion scorer since the relocation to North Bay in 2013. 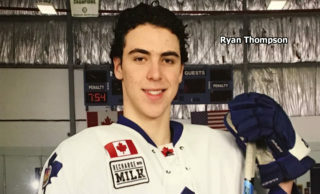 In 263 career games, Amadio amassed 92 goals and 134 assists for 226 points, but he had six goals and 13 assists for 19 points in 63 games as a rookie with Brampton in 2012-13, giving him North Bay totals of 200 games, 86 goals, 121 assists and 207 points. Theo Calvas and Brazeau assisted on Brandon Coe’s goal at 2:17 of overtime that lifted the Battalion over London after the Troops killed a tripping penalty to Nick King that carried 30 seconds into the extra frame. Goaltender Christian Propp provided 37 saves, including 15 in the second period and two in overtime. “I think really we played a physical game,” noted Dennis. “We played more of our style, and that’s something that we’ve wanted to do for quite some time here, is make Memorial Gardens a real tough place to play. The Battalion dressed 16 skaters, two below the limit, as forwards Daniel Walker and Kurtis Evans and defencemen Travis Mailhot, Simon Rose and David Maier all sat out. Walker was scratched with a shoulder injury and Maier a sinus infection, while Mailhot has played only three games this season and Evans has missed the last 13. The Sudbury game is Canadian Cancer Society Relay For Life Night presented by Epiroc. The Battalion completes weekend play when it entertains the Kingston Frontenacs at 4 p.m. Sunday. The game is the second to be telecast as part of Cogeco Hockey Day in the OHL, accounting for the later-than-usual start time.